Dupin Lite 2 at the Mac App Store is a lite-featured/lite-priced version of Dupin, the iTunes duplicates manager. Go to the Dupin Lite 2 product page. The Dupin Quick Start Video covers the basics. Bug reports, questions, comments can be emailed to support AT dougscripts DOT com. Include "Dupin Lite 2" in your subject line. A response will be sent ASAP. Before emailing, be sure your topic is not already covered here, in the Dupin Online FAQ or in the Complete Documentation in Dupin Lite 2's Help Menu. In the interest of expeditiousness, bug reports should contain precise details. Please note: Apple does not permit Developers to respond to reviews at the Mac App Store. Even so, it is unlikely that I will see reviews in any kind of timely fashion. Please email support AT dougscripts DOT com for prompt assistance. Version 1.4.0 released December 17, 2018. Is there a demo version of Dupin Lite 2? You can download and demo the full version of Dupin, which you may actually prefer. It has more features and no Mac App Store-required sandboxing restrictions. iTunes Preference Setting, "Share iTunes Library XML with other applications"
The "Share iTunes Library XML with other applications" setting in iTunes > Preferences... > Advanced allows access to the current iTunes library's XML file [screenshot]. 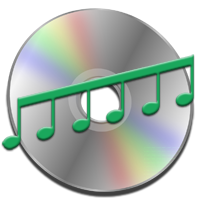 Dupin Lite 2 needs to access this file to get information about the tracks and playlists in your library. Be sure this setting is checkmarked ON. 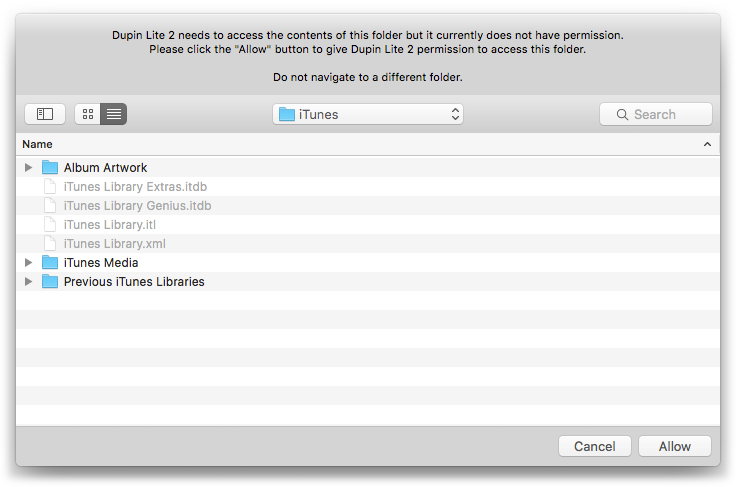 Otherwise, Dupin Lite 2 will alert you about being unable to access your iTunes library information. Because apps from the Mac App Store are "sandboxed" they are prevented from accessing most locations on your computer, so Dupin Lite 2 needs your permission to access these items. During its initial launch, Dupin Lite 2 will ask you to give it permission to access specific support files and folders. When a permission panel displays a folder you must not navigate to a different folder. Doing so will invariably cause problems and most likely prevent Dupin Lite 2 from launching correctly (for example, the main window not appearing). Simply click the permission panel's "Allow" button. The permission you grant will be saved and you will not need to grant permission again on subsequent launches of Dupin Lite 2. You can reset Dupin Lite 2 and start fresh using one of the methods below. Make sure Dupin Lite 2 is not running. Empty the Trash. Restart your machine. Then try launching Dupin Lite 2 again. Simply click "Allow" when each permission panel appears. Re-launch Dupin Lite 2. Simply click "Allow" when a permission panel appears. DO NOT navigate to a different folder than the one displayed for you. Sandboxing-related issues do not affect the full version of Dupin. I have library track entries that point to the same file. Impossible, right? Dupin Lite 2 displays a message saying it won't Purge them. What can I do? Use the script Scan For Double Entries, which gathers these double entries together into a specially created playlist. Select the "_Found_Double_Entries" playlist (the one created by the Scan For Double Entries script) in Dupin Lite 2's Playlist Popup. Now do a Get Dupes. Do a Filter using "Single Arbitrary"
Select these tracks in the playlist and press Option-Delete to remove them from iTunes entirely. When asked DO NOT Trash their files, since this will leave each surviving duplicate track without a file. Please note: Apple does not permit Developers to respond to reviews at the Mac App Store. Even so, it is unlikely I will see such reviews in any kind of timely fashion. So before you lodge a public troubleshooting complaint please email support AT dougscripts DOT com for prompt assistance. Full documentation is available via Dupin Lite 2's Help Menu. The Dupin Online FAQ page addresses several general usage questions that also pertain to Dupin Lite 2. Dupin is still available! Dupin v2.14.1 was released on September 21, 2018. What features from the original Dupin are not part of Dupin Lite 2? (These features are available to try in the un-registered demo version of Dupin.) Dupin Lite 2 also has additional minor tweaks to accomodate lite-ness. Can I demo Dupin Lite 2 before buying it from the Mac App Store? The Mac App Store does not permit demo or trial software. However, you can download the original Dupin and run it in un-registered demo mode. Dupin Lite 2 has many of the same features. I've already purchased a registration code for Dupin. What is the upgrade path? First of all, thanks for being a registered user. Dupin will continue to be updated as necessary through the website and its own internal updating framework, Sparkle. I've been using the original Dupin in demo mode and have yet to purchase a registration code. Can I still do so? Yes. If you want the additional features of the original Dupin. OR if you don't think you'll require the extra features (listed above) you can purchase Dupin Lite 2 from the Mac App Store. Can I upgrade from Dupin Lite 2 to Dupin? Technically, no. They are separate applications. But if you have purchased Dupin Lite 2 from the Mac App Store and now wish to use the full-featured version of Dupin please contact me for details on upgrading; I will need proof of your Dupin Lite 2 Mac App Store purchase and so on. Can I upgrade from Dupin Lite to Dupin Lite 2? No. Dupin Lite has been discontinued. If you have support questions regarding Dupin Lite please contact me. Why won't Dupin Lite 2 delete/Trash iCloud Music Library/iTunes Match tracks during Purgewhy are tracks copied to a playlist instead? This issue only affects the way Dupin Lite 2 handles track and file removal if you are using iCloud Music Library/iTunes Match. You may have noticed that when you delete an iTunes Match track, iTunes presents an alert that requires you to acknowledge that you actually intend to delete the track, and/or Trash the file, and/or remove the track from the cloud. Unlike other alerts in iTunes this alert cannot be suppressed by checkmarking a "Do not ask me again" option. If Dupin Lite 2 were to delete a number of tracks you would have to acknowledge this alert for each track. Not fun if you are Purging hundreds of tracks. The issue is that there is no way to delete a file in the cloud programmaticallypresumably for security reasons. Thus, iTunes is obliged to present the delete alert. UPDATE: iTunes 10.5.2 will not elicit the delete alert when a third-party app attempts to delete an iTunes Match track. However, third-party apps cannot remove an iTunes Match track from iTunes. This must be initiated by the user. To workaround this issue, during the Purge operation Dupin Lite 2 copies the iCloud Music Library/iTunes Match tracks you have designated to be removed to a new discrete playlist in iTunes. You just simply Option-Delete this playlist after the Purge (Option-Delete is the shortcut to delete a selected playlist and its contents from the iTunes library). When tracks are deleted this way, you only have to acknowledge a single set of delete alerts. Dupin Lite 2 Help contains more information about using Dupin Lite 2 when iCloud Music Library/iTunes Match is enabled. I'm using Tiger/Leopard and can't access the Mac App Store to purchase Dupin Lite 2. Dupin Lite 2 is for OS X 10.8 Mountain Lion and later systems only. The Dupin Online FAQ page addresses several general usage questions that also pertain to Dupin Lite 2.